Lt. Col. Virginia L. Sweet, 88, died Sunday morning, July 12, 2009 at Baptist Health Nursing and Rehabilitation Center in Scotia after a short illness. Lt. Col. Sweet was born on February 12, 1921. At the age of 12, she read a story about the flight of Amelia Earhart across the Atlantic. This started her great love for the sky and flying. She learned to fly at the Schenectady Airport in the summer of 1940, in a civil pilot training program. When she obtained 200 flying hours, she joined the WASP in class 43-W-4 in Houston, Texas, then went on to basic and advanced training at Avenger Field in Sweetwater, Texas, where she graduated and was assigned to Romulus, Mich., in the Third Ferry group in ATC. 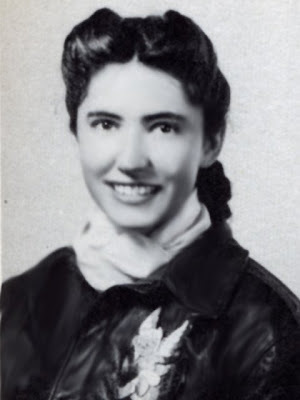 She attended instrument school, officer training school, and pursuit operational training, where she qualified in the P-39, P-40, P-51 Mustang, and P-63. By the time she was relieved from active service she had flown 52 different types of military aircraft as pilot-in-command, and qualified as co-pilot in the B-17, B-24, B-25, and the PBY-5 Catalina flying boat. The Amelia Earhart Scholarship was presented to Miss Sweet in NYC in 1949, by Maj. Gen. Robert M. Webster, Commanding General of the Eastern Defense Command of the Continental Air Command, United States Air Force. After World War II she served a reserve commission in 1949 and spent five years on active duty during and after the Korean War. She retired from the USAF Reserve in September 1979, as a lt. colonel after 30 years of service. Her military service as a WASP was not recognized until 1977, when the Department of Defense acknowledged the WASP as members of the military. On July 1, 2009, the president of the United States signed the bill "S.614" to award the WASP the Congressional Gold Medal, the highest honor Congress can bestow upon a civilian. After WASP deactivation, she had a lifelong aviation career, adding some 55 different civilian types of aircrafts to her flight log, along with 14 sailplanes and gliders. She held a commercial pilot certificate with ratings for single and multi-engine land and seaplanes, gliders, and an instrument and instructor certificate. She was an advanced ground school instructor and was a flight examiner for many years. She taught flying at Lake Champlain, at RPI to ROTC cadets, and at most of the airports in the Capital District. After a humble educational start in a one room school house in Quaker Springs, N.Y. she received diplomas from the Duke University and the Sorbonne in France with degrees in languages. She taught French, Spanish, and Latin for a number of years. She was predeceased by her father, Harry P. Sweet and her mother, Jessica S. Sweet; sisters, Betty (C. W.) Skinner and Helen (Leonard) Grinter. Survivors include cousin, Robert (Barbara) C. Smith of Fla. and Vt.; nephews, Edward (June) Grinter of Schenectady, Charles Skinner of Md., William (Dawn) Skinner of Md. ; nieces, Suzanne Skinner of Md., Margaret Helen (Arthur) of Md., Betsey (Thomas) McBride of Niskayuna, Barbara Grinter of Schenectady, Phyllis Jane (Jeff) Joy of Md. ; and several great-nephews and nieces. A memorial service will be held on Saturday, July 18, 2009 at 10 a.m. at Bond Funeral Home, Broadway and Guilderland Avenue, Schenectady.